Duke was a right handed tattooist who worked during the 1940s and 1950s in the San Francisco Bay Area We know that he worked in at least two locations: 1138 Market Street, San Francisco in the Playland Arcade, and at 1958 San Pablo Avenue in Oakland. 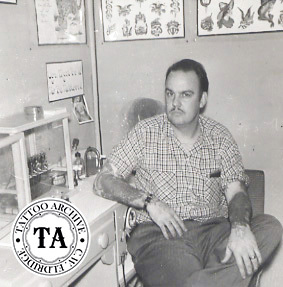 A good number of photos exist that show Kaufman's shops and his tattooing. 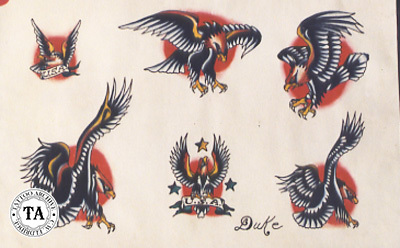 Thanks to the great Vern Ingermarson Collection, many sheets of Duke Kaufman's water colored flash have survived. There is so much more to learn about Duke Kaufman! Find it in The Life & Times: Ralph "Duke" Kaufman in our online store.